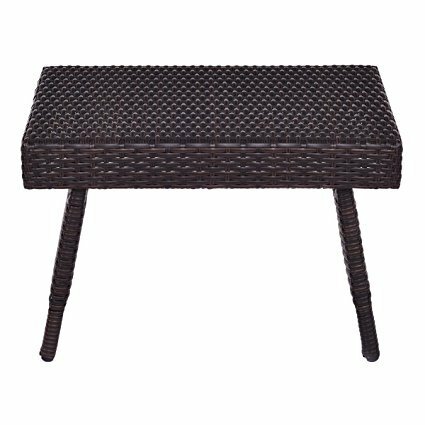 Our mix brown folding PE rattan side coffee table is made out of durable, weather-resistant resin and features an open-weave material that will not fray and can tolerate high summer temperatures and withstand UV rays without fading. Their Contemporary design and ergonomic comfort are exactly the right combination for your outdoor living space. With the feature of folding, this rattan coffee table is portable and convenient to storage when do not using. Wide table top providing enough space for holding your bottles, cups, magazines and other item. Do not hesitate to buy one! High quality and brand new. Be made of PE rattan material, durable and weather-resistant. Contemporary design and ergonomic comfort. With the feature of folding ,portable and easy to storage. Perfect for sofa side. Table top is wide enough for your bottles, cups and magazines. Specification: Material: PE rattan Opening size: 24.0"x16.0"x16.0"(LXWXH). Folding size: 24.0"x16.0"x3.0"(LXWXH). Product weight: 9.2lbs. Package include：1 x folding rattan coffee table.